cuts silver or gold strip to size required by turning handle of cutting machine; cleans strip with fine file; bends strip to shape and secures it to pipe stem with plaster of Paris, cement, etc. ; solders overlap and burnishes band on small lathe; cf. mount maker (287), pipe mounter. see mounter ; cf. maker-up (287). assembles, and fits together, parts of gold, silver, or other precious metal articles, e.g., candelabra or coffee services, etc., by riveting, soldering, etc., using various small hand tools and blow pipe and solder. a pipe mounter q,v. who mounts pipes made of briar (bruyere) root. 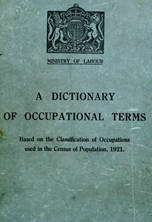 an outworker employed by jewellers (retailers), jewellery manufacturers, or factors, as a mounter q.v. fixes mounts of brass, britannia metal, nickel silver, or silver plate, to oak cabinets, canteens, biscuit boxes, trays, liquor frames, etc. ; bores holes in wood and drives in small screws or rivets. a mounter q.v. who cements silver mount on to stem of pipe. a mounter q.v. who fills in with soft or hard solder back of beaded or other design which forms ornament on tea and coffee service sots, entree dishes or other work; mounts pressed or stamped parts in position, and gets article ready for polishing. fits silver mounts on to metal, wooden, earthenware and glass articles by means of plaster of Paris or by small rivets, nails, etc., and/or soldering. cuts out, on machine cutter or with hand shears, gold and silver bands or other ornaments and fits them, by hand, on to umbrellas or sticks, with cement, rivets, etc.